Anambra holds its governorship election today. The election is holding amid tight security following threats by different groups to either disrupt or boycott the exercise. The Independent National Electoral Commission, INEC successfully distributed electoral materials on Friday ahead of today’s election. Today, November 18, electorates in the ‘Light of the Nation’ would march to polling booths across the state to elect who would captain the ”political ship” of the state in the next four years. The Independent National Electoral Commission, INEC, had since released names of 37 successful candidates, who indicated interest in becoming the next governor of the State. However, among the 37 contenders, four persons have been tipped for the number one seat. Among the four top candidates are the incumbent, Willie Obiano of the All Progressives Grand Alliance, APGA, Oseloka Obaze of the Peoples Democratic Party, PDP, Tony Nwonye of the All Progressives Congress, APC, as well as Osita Chidoka of the Unity Party of Nigeria, UPN. Interestingly, Nollywood star, Yul, son of veteran actor, Pete Edochie is also in the race. He is running on the platform of the Democratic Peoples’ Congress (DPC). 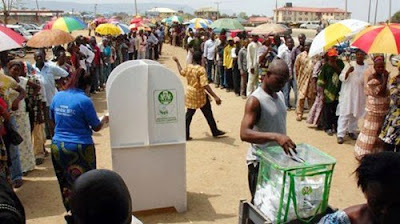 INEC had said that 2,158, 171 eligible voters are expected to participate today’s election. The Anambra State Commissioner of Police, Garba Umar also announced that the force has deployed 16,000 officers for the over 4,000 polling units to ensure a hitch-free election. The D-day is here and the battle has been drawn along this line. Your dependable Nigerian news portal, GIFTEDBLOG is currently in the state to bring you live updates, results as well as situation report.